This episode features a speech Dr. Caldicott delivered in Battleboro, Vermont in April 2009. The Battleboro community are fighting to close down the ailing Vermont Yankee nuclear reactor, and Caldicott explains the medical consequences of living near a nuclear plant, and the situation locals face should the reactor leak or melt down. Near the beginning of her talk, Dr. Caldicott says the elementary school right next to Vermont Yankee was constructed by Entergy, which builds nuclear power plants. Dr. Caldicott stresses throughout her speech how nuclear radiation particularly affects children. See the August 6 article Group calls for probe of Entergy, and also read Leaving Dirty, Dangerous Power in the Past about why this reactor should be closed. Read a 2008 article, Nuclear Leaks and Response Tested Obama in Senate, about President Obama’s connection with the nuclear power industry. Exelon, a nuclear energy firm, donated over $200,000 to his campaign. 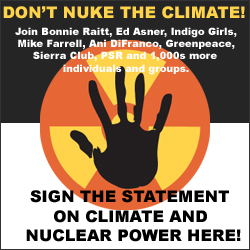 See the July 8 article Obama Makes Nuclear Compromise to Pass Clean Energy Bill. Also read the July 24 article, Nuclear Industry Donations Target Moderate Democrats which documents the nuclear power industry’s continuing influence on Congress. A New Vision of Security: Remembering Randall Forsberg. Dr. Caldicott urges Vermont citizens (and people who want to close any other U.S. reactor) to meet with legislators and teach them about the medical effects of nuclear power. She then describes the nuclear fuel cycle, starting with uranium mining, and points out how much fossil fuel is required at every step of the way, repudiating the nuclear industry’s claim that nuclear power is “emission-free.” She says that National Public Radio and other media should reject ads from the Nuclear Energy Institute, because the NEI consistently lies to the public to make their case for nuclear energy. Dr. Caldicott covers the dangerous plans to “recycle” uranium into clothing and furniture, and how the nuclear power industry uses enormous quantities of ozone-layer-damaging chlorofluorocarbons (banned by the Montreal Protocol, but allowed for the nuclear industry). She mentions a German study, led by pediatrician Dr. Winfrid Eisenberg, which found a higher-than-normal cancer incidence around nuclear reactors. She describes how a nuclear power plant could melt down, and all the frightening variables that could go wrong to initiate a disaster which would affect hundreds of thousands or even millions of people. She reads from her book Nuclear Power is Not the Answer, a companion to her other book on nuclear power, Nuclear Madness: What You Can Do. Dr. Caldicott underlines how the public is ill-prepared to deal with the devastation of a meltdown. Dr. Caldicott says. She gives an example of how she and other activists, including Dr. Patch Adams, were able to attract extensive international media attention in 1999 to the need to safeguard nuclear materials during the Y2K transition by using a clever publicity gimmick. Dr. Caldicott says that it is simply preventive medicine to want to close Vermont Yankee, which she calls both a “cancer factory” and a “bomb factory.” She reveals how the radioactivity of uranium increases by a magnitude of one billion when used in the plant. If Vermont Yankee were to melt down, it would render Vermont (and probably much of Massachusetts) permanently uninhabitable. Read about the 2007 cooling tower collapse at Vermont Yankee, an example of the fallibility of all nuclear power plants. This entry was posted on Monday, August 10th, 2009 at 12:00 am	and is filed under Uncategorized. You can follow any responses to this entry through the RSS 2.0 feed. Both comments and pings are currently closed.